That's how I end up making a cake this morning. I diced some strawberries and mix them in to lemon cake batter. When it came out of the oven, the aroma of strawberries filled the kitchen. One more thing...I have been working on a project using my old cardigan. I was stuck for a couple weeks (I couldn't decide how I wanted to finish it) and it was sitting on the table. I finally made up my mind and started working on it again. I think I can share the tutorial pretty soon with you all. Here is the cardigan. Can you guess what I am making out of this? Ok, it is time for you to share your project with us. Let’s start the link party! Now, Let's see what you've been up to!! Hi everyone! I hope you all had a wonderful Easter weekend. On Saturday, I went to help out with the yard sale I posted about several times. It got postponed the first time due to bad weather, and just a few days before the yard sale, the location had to be changed. I was a bit worried that people would not come, but I am happy to report to you that the yard sale was a huge success! Big thanks to the Noah Webster Academy! They allowed us use the gym for this yard sale. There were times it rained a little, but most of the items were in the gym. It worked out perfectly. I met so many wonderful people that day. The people who organized the whole thing, helping out with their time, talents, and man power (it was a lot of work to set up and clean up). They were all there for one reason: to help the people in Japan. We all had the same desire to do something for a good cause. Even the many people who came to shop or donate were so nice. I witnessed a few times that some people would pay for the stuff they bought, and wrote checks for more than they needed to pay. I couldn't help myself, I teared up a little. It was a busy day, but I can't think of a better way to spend my Easter Saturday. There are so many items to sell in the gym and outside the gym. The yard sale wasn't only for used items. There were some booths for crochet hats, hair bows, jewelries, badges, and custom order t-shirts! Many children LOVED the balloon man. He was so talented! He created many cute balloon animals that I have never seen before. At the end of the day, we pulled out the name for the winners for the quilts and aroma therapy oil kits. 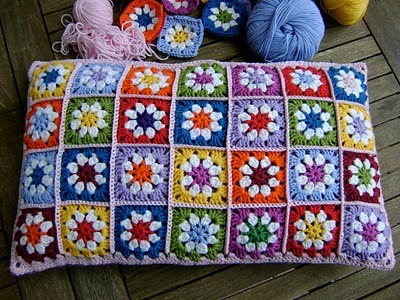 When I delivered the quilts to the winners, I felt a sense of peace and calmness. I know this is just a beginning, because the people in Japan will need help for a long time. My friends and I are talking about the next project. I don't know what we can do with limited time and resources. But I know when people come together for a common goal to help others, we can do something big. I am happy to say that, this yard sale raised over $5000.00! They are all donated through the LDS Philanthropies. If you are interested a detailed report on the proceeds go check out the website liftjapan.org. The web site was founded by group of MBA students at Brigham Young University (their efforts are not officially endorsed by BYU), who have a deep desire to help people in Japan. In fact, one of the people who founded the website was at the yard sale working hard. They have a few links to trusted organizations that would help people in Japan's immediate needs. Please go check out their site if you are interested. Since the earth quake, many thoughts went through my mind. The experience at the yard sale definitely made me think a lot about us. "Us", people. Bad things (I am talking about many different things in general) happen to good people, I have seen many of those in the past. I believe that they are sort of a test to see how we can pull through that situation. And I know that the challenges are not just for the people in the middle of the hardships. As a child of God, we are also tested for our compassions, generosities, humility and so on. Don't you think so? My family is still in Sendai. I don't think they are worried like I am. There are days that I get frustrated at being so far away, and feeling so useless. All I can do right now is keep moving forward with the effort to make a difference. Hopefully, when my family needs help, people close by will give them a helping hand. Hi everyone! I hope you all had a wonderful Easter weekend. Mine was really busy but very fulfilling. The fundraising yard sale for Japan went very well (I will post about that next week), I was able to meet many amazing people, and I witnessed some great act of service throughout the day. It is time to share my link love. What was your favorite? Maybe Matilda shared a Floral Love Tee. She took an inspirational piece, and turned into something she LOVEs! It is an easy way to make an ordinary t-shirt into something special. Check this play kitchen out! 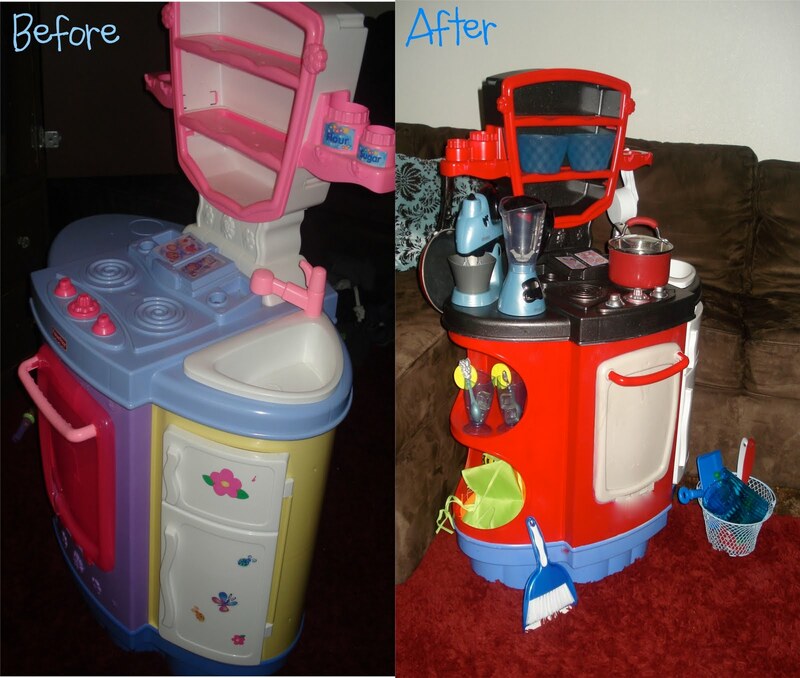 Emily from The Toasted Coconut did such a great job "remodeling" the kitchen for her two year old daughter. What a difference! Yes, it is a same kitchen, but I love the "after" kitchen much better. Oh, my word... when I saw the picture of this I couldn't figure out what was on the wreath, I got closer and saw how amazing this wreath is! The Silly Pearl made each one of those party blowers with help from a tutorial she found and made them into a wreath. 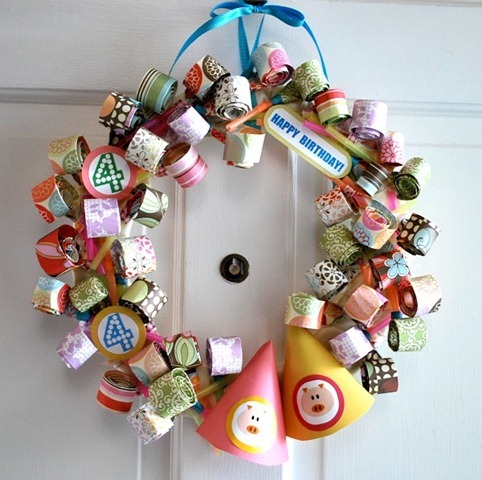 So fun and pretty, her girls are so lucky to have such a crafty mom! I have been in a mood for cupcakes for several weeks now... I am not just talking about eating, but making them. And, I want to make them from scratch (if you have any GREAT recipes, please email me!) and decorate them really pretty! I was at a book store the other day looking at cup cake recipe books with my little girl. There are many of them and I couldn't make up my mind! I came home empty handed. 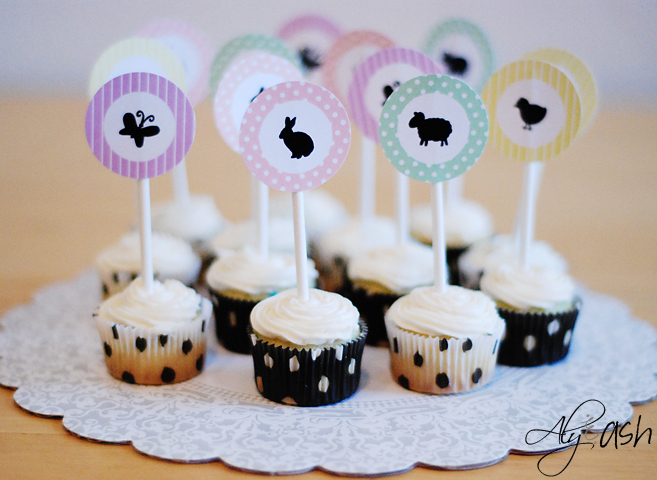 Anyways...Aly & Ash Creations shared one of the fun ways to decorate cupcakes. Visit her blog for free printables! 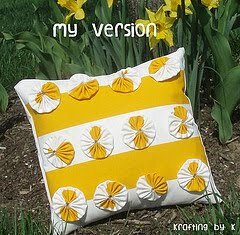 The last one for this week is shared by Krafting with K. She was inspired by one of the Kate Spade's design and came up with her version of the pillow. Bright color and contrast of white and yellow is so refreshing and cheerful. Thank you all for the participation. Happy creating! By the way I have a quick announcement. The fund raising yard sale for Japan that my friends were organizing was originally on the 9th but it got rescheduled due to the weather to this Saturday, yes, that is tomorrow!! It is close to Orem High, and just off of State Street, so I think you can find it pretty easily. And guess what... I will be there too! If you live in the area, please come by to show some support. Also, don't forget to enter for a chance to win this quilt made by me (with my wonderful friend's help)! I also heard that there are other prizes that you can win. Every contribution will help in times like this. I was at a park sometime in last week. Michael gave me this white flower he found on the ground. I was sitting right next to a pretty carpet of yellow flowers; I had to get a picture of both. Aren't they so beautiful? I am not exactly sure the name of the white flower, but I am pretty sure it is type of cherry blossom. In Japan, it is almost time for "Hanami". Hanami is basically "flower viewing", it is one of the Japanese traditional customs of enjoying the beauty of flowers, especially cherry blossoms. The history of Hanami is more than a thousand years old, and is still very popular in Japan today. I have many memories of Hanami. I remember one of the field trip in elementary school was Hanami. Another time, my mother packed a special Bento-box and took us to a river-side where so many cherry blossom trees were lined up, and the flowers were in full bloom. Every time the wind blew, some of the flower peddles would leave the branches and would float in the air... it was such a beautiful sight, I will never forget it. My heart goes out for people in Japan who are affected by earthquakes, the tsunami and radiation. I wonder if the beauty of flowers will still bring joy to some of the people in Japan when they are in such turmoil in despair. Many people asked me how my family is doing, how people I know are doing. I am very grateful for your concern and kind words. All I can say is they are ok so far. They are trying to live a normal life and keep moving forward. Being so far away, the only thing I can do is to send them packages and call them often. My husband and I offered them to come here and stay with us, but they didn't sound too keen about leaving Japan. In the meantime, I am also trying to live a normal life and keep moving (well, maybe not necessarily "forward" but moving). Eating some of the food my family or friends will like remind me of them. Doing something fun with my family make me think about them how they are doing. Looking at beautiful flowers reminds me of some of the memories growing up... How ironic that people in one part of the world are living in the chaos. And someone like me in another part of world is sitting and enjoying the beauty of flowers and time with family. I just hope people who are missing will be found and reunited with their loved ones. And somehow, those survivors will find a way to cope with the sadness and have the will to live. Ok, it is time ever body, time for the link party! Can you believe that it is link party No. 50!? I have been doing this for that long? I wonder if I can shoot for 100. You know the rules, go ahead link up your projects; I can't wait to see them. Have you ever had that moment where you can feel your strength leaving your body? There were thousands of shattered grass pieces on the grass. You can't sweep them, or vacuum them up; they are all so nicely blended in with the grass. I have to pick them up one by one. So far I did about half, but the pieces are still there. Ugh! Every Patio Furniture was created specifically to cater to the needs of people looking for patio furniture. They provide a variety of items at affordable prices to their customers. They are also continually growing the range of products they offer and making sure that there are pieces in the price ranges of everyone. Since my table is broken, I went to their site to check out their outdoor sofa sets, and dining sets etc. 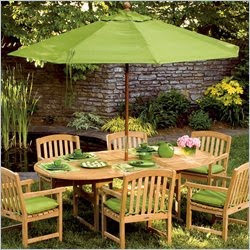 Oxford Garden dining table set... What a beauty! I would cook my best dishes for this dining table set! 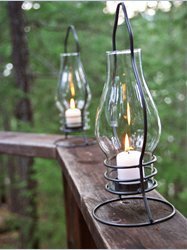 I also found this great outdoor lighting, Pangaea Iron Table Lantern... Wouldn't it be so pretty to have them on the table at night? 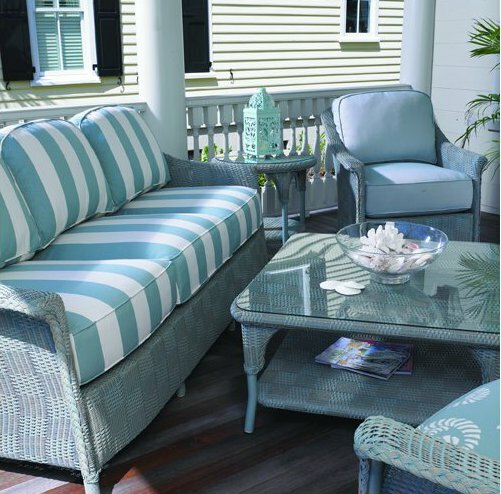 And, this out door sofa set is for my imaginary beach house... the great thing about this is you can semi-customize by choosing your own finish and fabric. Cymax Store is giving away a $50 gift certificate for Every Patio Furniture! There is still time to shop for your mom (or yourself) for Mother's day. You could use the gift certificate towards bigger items or find nice accessories for outdoor too. I will run the giveaway till Thursday the 21st, and announce the winner on the Friday the 22nd. Good luck everyone, this is soo exciting! Make sure to come back to see what it is. You don't wanna miss it! Are you ready for this week’s link love? 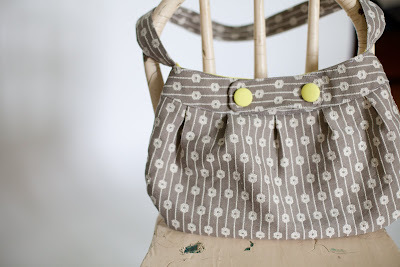 A Winding Road made this very sweet Buttercup bag. I love her fabric choices, and two buttons in front add extra charm. Growing up in Japan, I didn't really eat jelly beans until recently. 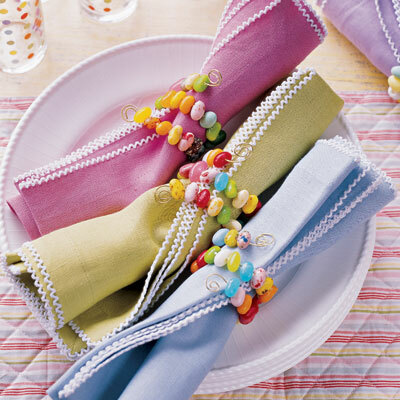 But jelly beans are so much more than just candies...Check out the post by Kids Cats Clutter and Klutz She shared 10 fun ideas of what you can do with the jelly beans. I got to try some of them. How fun! I. LOVE. THIS. 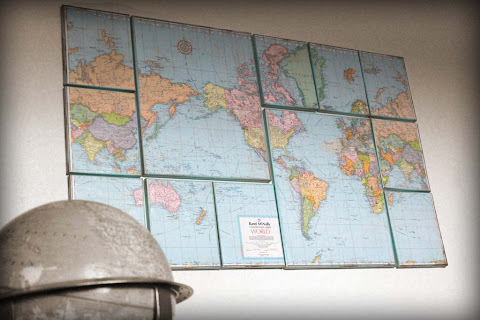 I always had a thing for maps, I was actually thinking about decorating my boys` room with a world map. Creative Juices Decor took decorating with maps to a whole new level! 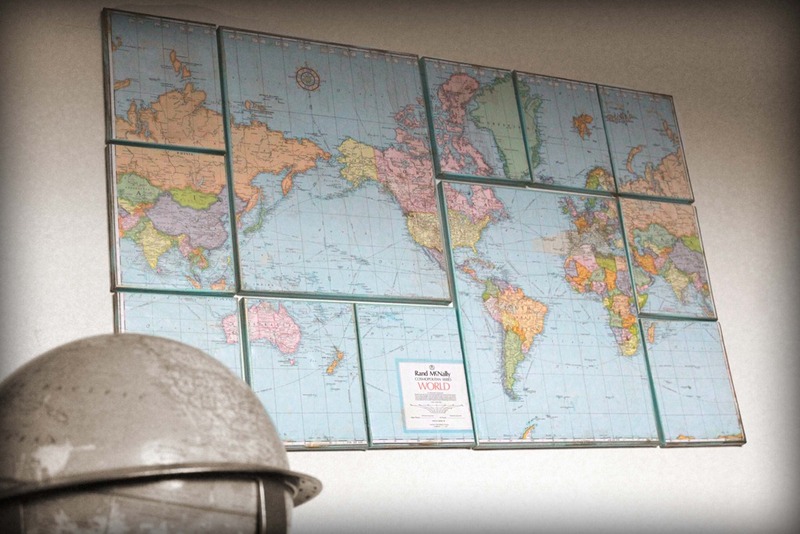 What a stylish and creative way to display a map. 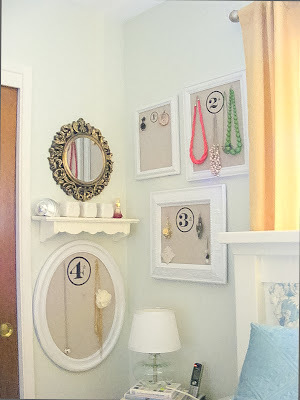 I have seen many framed jewelry holders, but I want you to check out what Andrea from Blue, Lace, House did. I love how they are a collection of beautiful frames. The stencil makes them even more special. Thank you all for being a part of link party at Tea Rose Home. Enjoy spring, and happy creating!